Unpacking the standards. If you don’t know what this term means, let me break it down for you. 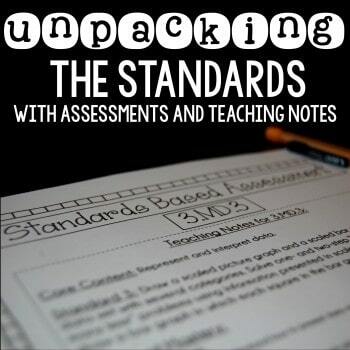 Unpacking the standards means that you, as the teacher, are to look at each standard, and think about each standard’s sub-objectives. This is important because you need to understand what students need to be able to do in order to master the standard, and what it looks like when they master it. This is huge. How will you know what to teach if you’re not 100% sure what the standard is saying? How will you know when your class full of 30+ students with different backgrounds and learning styles have actually mastered a standard? Well, the great news is, I have done the work of unpacking the standards for you. 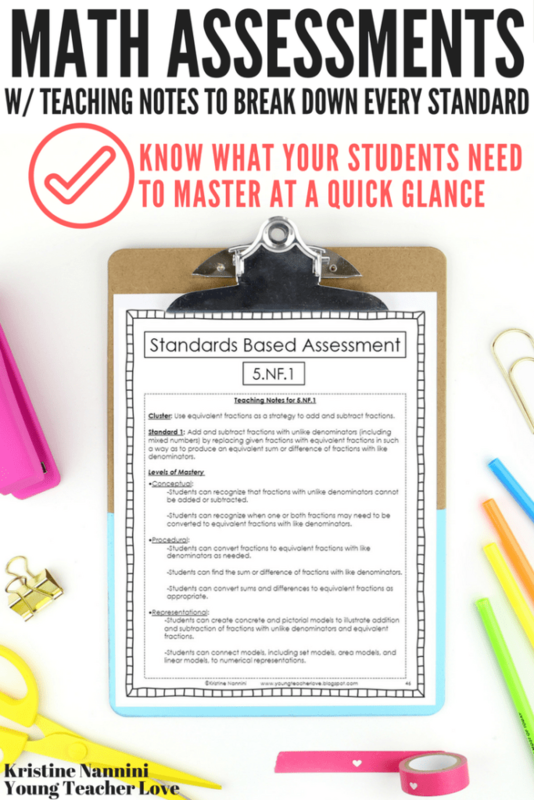 In each grade level’s version of my Math Standards Based Assessments and each grade level’s version of my English Language Arts Assessments and Teaching Notes, I have broken down each individual standard for you in my easy-to-use teaching notes. First, let’s talk math. 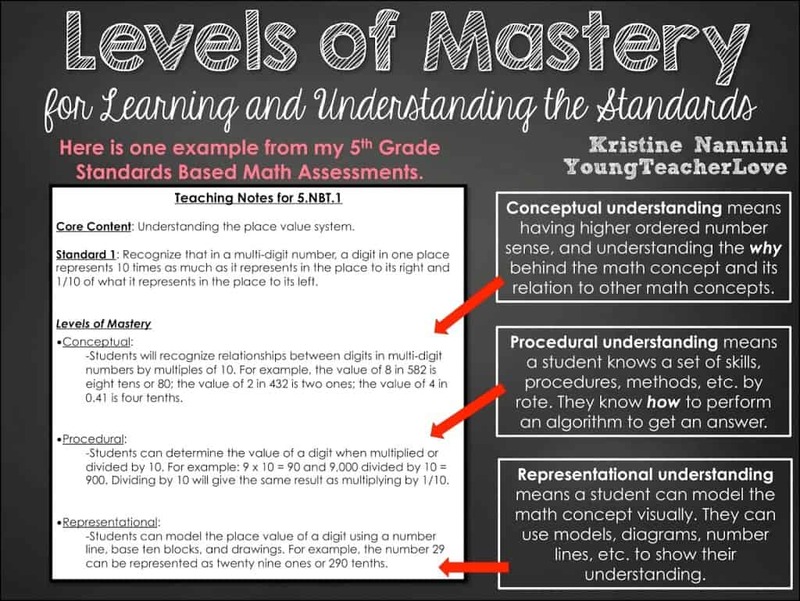 These math teaching notes seriously excite me due to the fact that I broke them down into three levels of mastery to better understand not only the standards, but also my students’ understanding. The three levels include what students should know and/or be able to do at the conceptual level, procedural level, and representational level. These teaching notes have completely transformed my teaching. 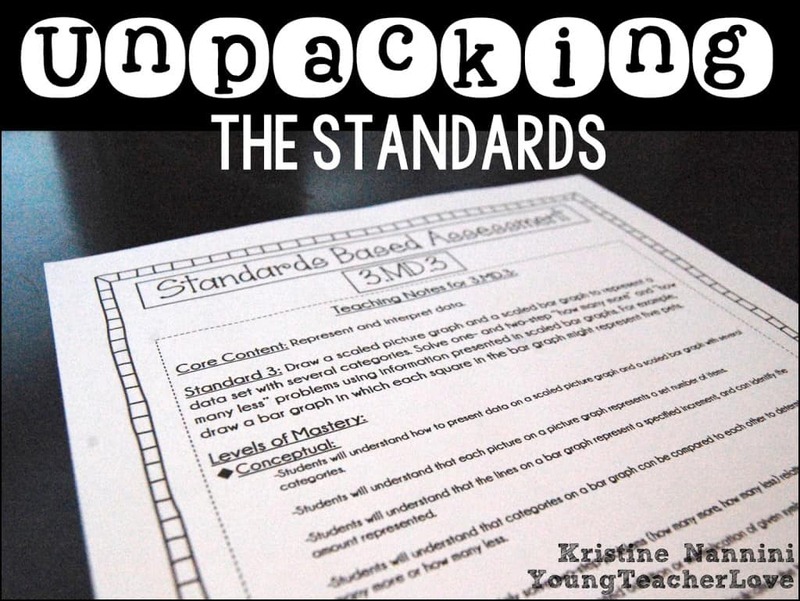 With the standards broken down into what your students need to know at the conceptual, procedural, and representational level, you will have a much better idea of the language of the standards and where your students need to be by test time. Plus, modifying and differentiating your lessons will be so much easier. 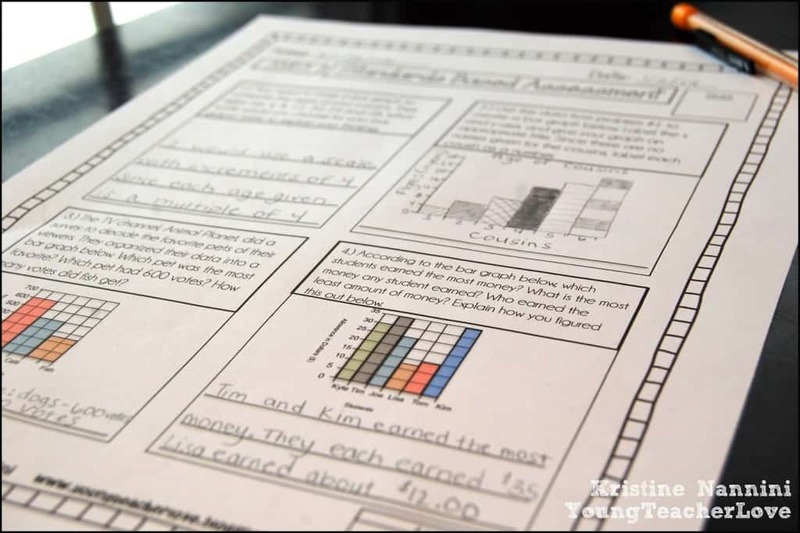 Besides the comprehensive teaching notes, these assessments also include a page for students to document the “I can” statements that align to the standards and space for students to record their pre- and post-assessment scores. 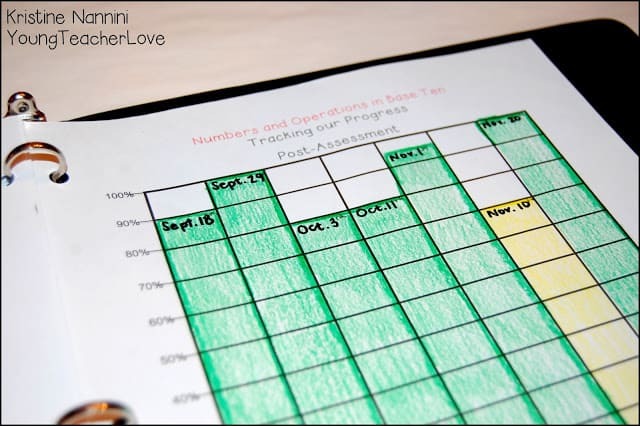 This tiny piece of organization is huge for teachers using my Student Data Tracking Binders or for teachers who may not use my Student Data Tracking Binders but need to stay organized and knowledgeable about their students’ progress. As many of us know, the standards require that our kids have more of a conceptual and representational understanding of this math versus only a procedural understanding of the algorithms. I worked hard to create assessments that have a perfect mix of questions designed to test conceptual, representational, and procedural levels of mastery. As you can see from the examples below, many of the questions require students to justify and explain their thinking and represent their answers using visual models. There are also questions that test procedural understanding, because that is important, too. As you can see, every individual math standard has an appropriate mix of conceptual, procedural, and representational types of questions that align perfectly with the standards. I also created detailed answer keys for each question and wrote out sample student responses for each of the writing to explain questions. 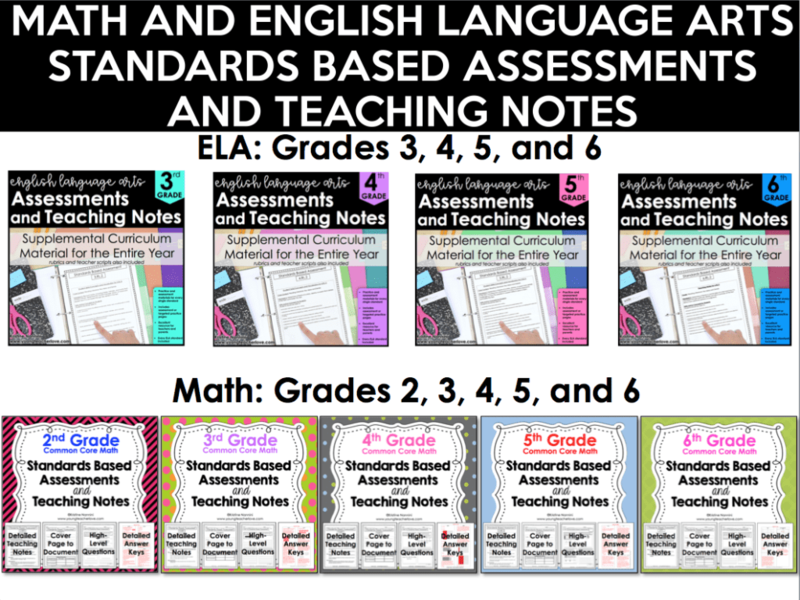 Below are all of the Standards Based Assessments and Teaching Notes for both Math and English Language Arts. Click the button below to check each one out and to see a more in-depth preview! 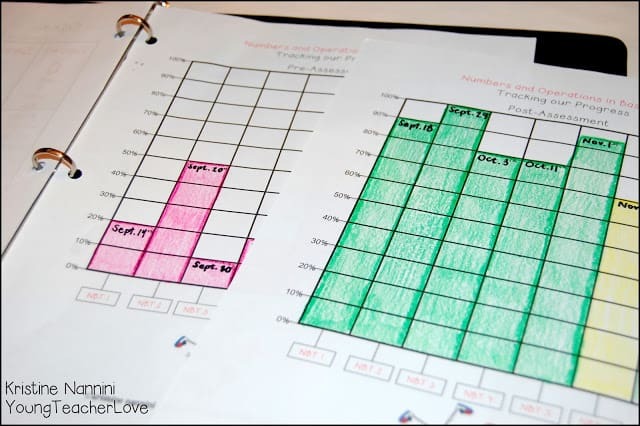 Are you using my Student Data Tracking Binders in your classroom? 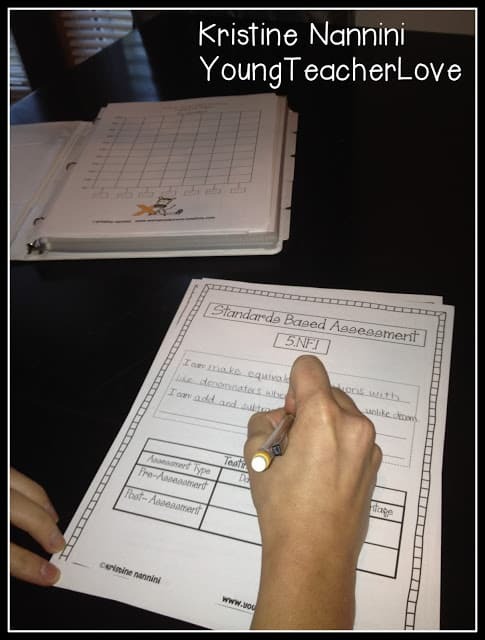 If yes, these assessments are aligned perfectly to use with my tracking system in your classroom. 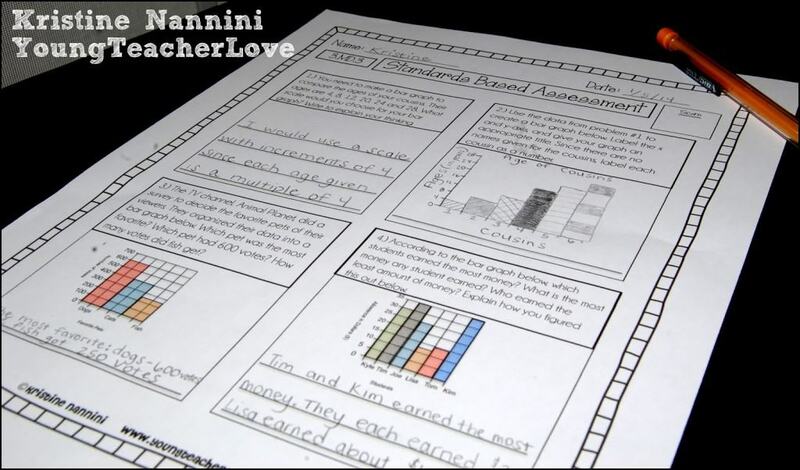 If you are not using my Student Data Tracking Binders, you can still easily use these assessments in your classroom. If you are interested in learning more about my Student Data Tracking Binders and the tremendous growth I have seen in my classroom, click HERE to read more about them! 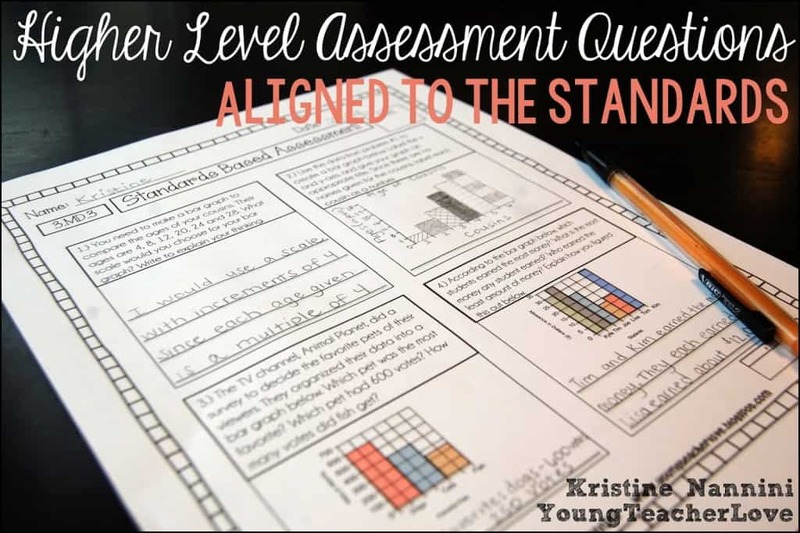 I use these assessments as pre-assessments before teaching any of the standards, and then again as a post-assessments at the conclusion of my unit or teaching of the standard. 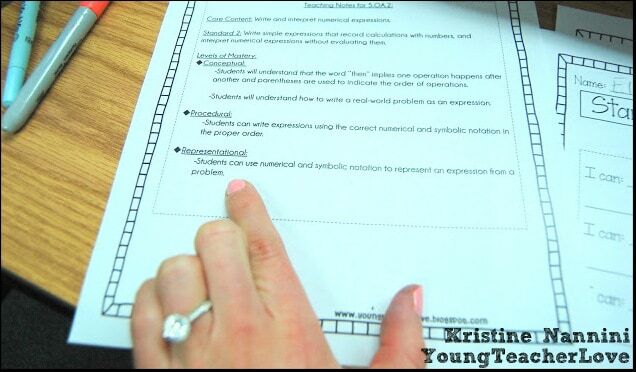 Pre-assessments play an important role in your ability to differentiate instruction. You administer pre-assessments in order to understand what students know and are able to do before you begin instruction. Post-assessments are used to evaluate student learning, skill acquisition, and academic achievement at the conclusion of your defined instructional period. Post-assessments also help teachers see which students, if any, may need additional re-teachings and/or interventions of a standard. Using these pre- and post-assessments with my Student Data Tracking Binders has been such an incredible experience in my classroom. Never before have I seen such intrinsic motivation from my students about their learning. Their test scores are shooting through the roof, and it has completely transformed both their learning and my teaching. 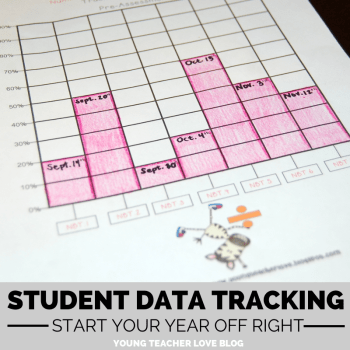 Click HERE to learn more about my Student Data Tracking Binders. Click HERE to check out my Math and English Language Arts Assessments and Teaching Notes for your grade, and download the previews for more information! 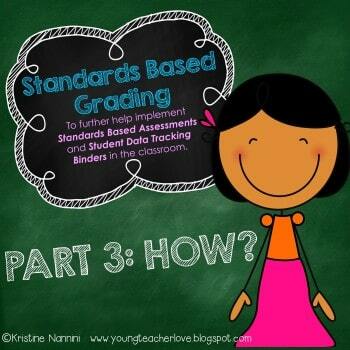 Are you using Standards Based Grading in your classroom or school? 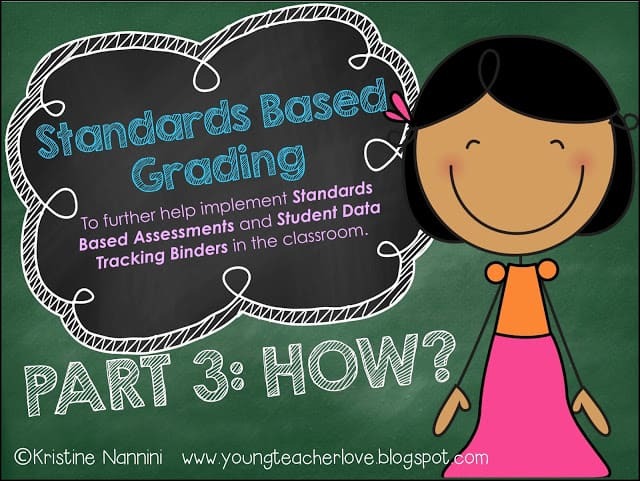 Check out my entire series of blog posts on standards based grading below! **The assessments written about below are for 2nd, 3rd, 4th, 5th, and 6th grades. **Also, I now have English Language Arts Assessments for 3rd, 4th, 5th, and 6th Grades! Check them out HERE. 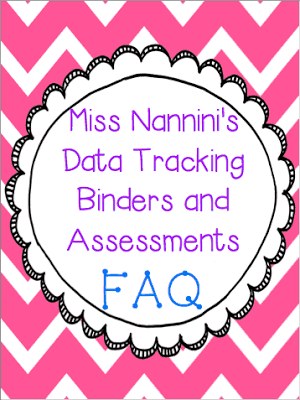 Still have questions about implementing My Student Data Tracking Binders and Assessments? Grab my free Frequently Asked Questions Freebie HERE! I hope you will work on 6th grade assessments! Please let me know if you do! 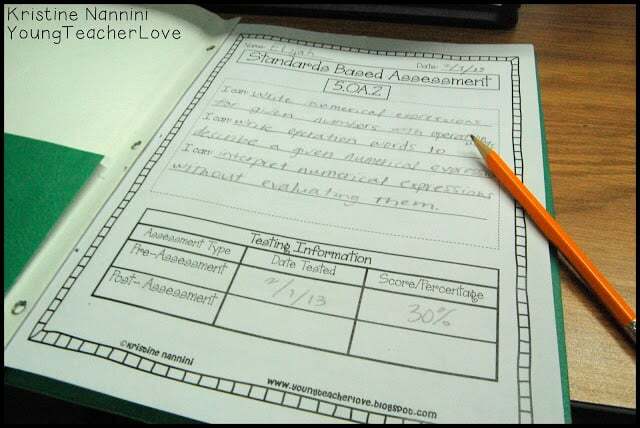 I would love 6th grade assessments as well! I’ve searched everywhere for some and can’t find them. I will definitely use your 5th grade ones! Thanks so much! These are great! I see you have a 2nd grade data tracking and graphing binder, so are you planning on including 2nd grade assessments? That would be great! These look great! Do you give these as your pre-assessment, post-assessment, or both for the student data binders? 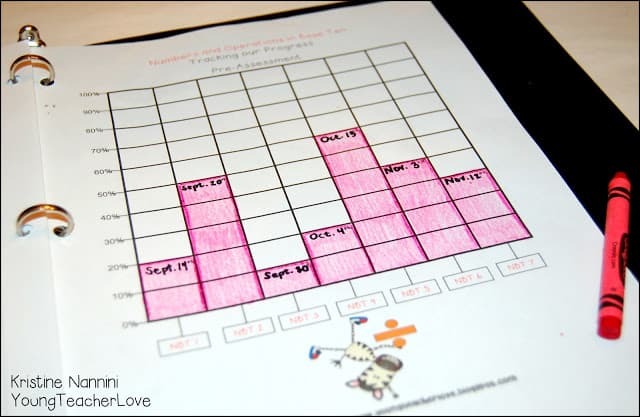 The part where the kids are graphing their scores… where do those come from? 6th grade, 6th grade… these are too amazing! Thank you so much!!! I am already overwhelmed with a 3/4 combo this year… this are going to be a lifesaver! I would love to have these for 1st grade. Have you thought about making a first grade set? Is ELA out there and I just haven’t found it yeat? Your work is awesome! I can’t wait for your 6th Grade Standards Base Assessments. Are you going to do 6th grade ELA? Yes- All of my assessments come with detailed answer keys. Do you have the complete set for 4th? Am I missing something? 4th grade is in my store! It’s a bundled product, or you can get the individual ones. Thanks! Hi Jess! Thanks so much for your comments! You are too sweet! I do plan to make 1st grade! Hopefully after the holidays! Thanks again! Any plans to make a math assessment pack for kinder? Oh I am excited that you agreed to do 1st grade!! I’m your newest follower! girl, you know how much I love your stuff….but I have to ask you…when do you sleep? This is so crazy good, I am impressed! Oh please, please do a 7th and 8th grade math!! You are amazing! Another vote for a Kinder packet! These are incredible!! Yes I am! 5th grade should be out right after Spring Break, and I’m already finished with half of 3rd grade ELA!!! First of all…YOU ARE AWESOME!!!! I LOVE everything you have made! I have two questions. First, what kind of binders do you suggest purchasing that are durable and will last all year? Second, will there be any 5th grade ELA assessments to go along with the CCSS? This year I used duo-tang pocket folders and they were PERFECT. Held up all year long. Last year I used 3-ring binders, but of course they cost a bit more. I did a lot of teaching though on keeping your binders nice, neat, and organized so they don’t fall apart. I hope that helps!??! I LOVE YOU!!!! I can’t wait for the ELA Assessments to come out!!! Ok, back to binder question. So you actually use folders and NOT binders. How do you keep everything organized in a folder? With prongs? Yes, surprisingly this year I was able to use folders with the middle prongs and they managed to hold all of our papers PERFECTLY. But, I prefer binders instead. I know this upcoming year I will be using binders, 100%. I am going to have my students use the 3-ring binders and also use dividers to keep their binders organized. I do plan on blogging more soon to show exactly how I set these up! I hope this helps! Take care! In what order do you teach the Math units? I have not taught ccss yet and I’m not sure what order to put them in. Thanks! These look amazing!!!! Are you still going to be doing one for sixth grade??? I would love to buy that one :) Nice job, and thanks for the hard work! Hi! I bought your 4th grade math assessment bundle. I have been using the assessments and plan to incorporate the student component where they rate their learning next fall. One of my colleagues purchased the fifth grade binder for ELA. I really can’t wait for the fourth grade binder for ELA. Any idea when that will be ready? I got the tracker portion of it, but would love to have all of the assessments. Your work is phenomenal!! Thank you! Thank you Bridget!! I am working my tail off to have it out for you fabulous 4th grade teachers before school starts back up. I know it will be done sooner though, so keep a look out for it! Thanks again for your kindness, I appreciate it! Do you have a pacing plan of sorts for ELA and math? I have not taught the CCSS and am not sure if there is a sequence to the lessons. Thanks! I just recently found out I am moving from 1st grade (the last 10 years of my life) to 3rd grade next year. I happened upon your data binders as I was searching TPT to calm my nerves over the change. I am now following your blog and store. I am going to read your blog this summer for more ideas. I have been teaching common core so I am not nervous about that part. 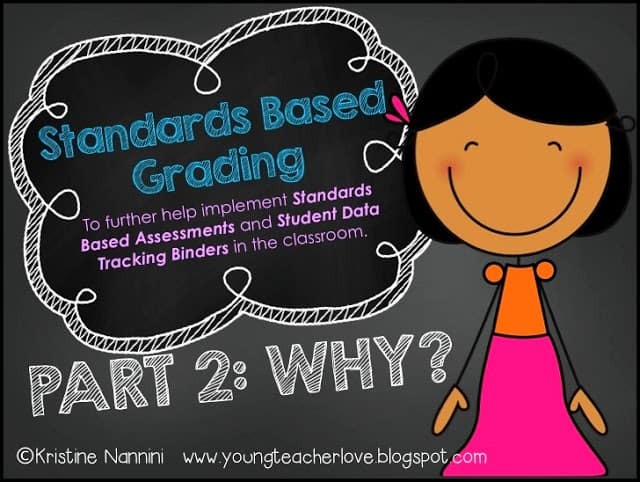 I am very interested in the standards based grading. Do you have a pacing plan for how you teach your standards? Is it worth my time to read the Marzono book you have mentioned in your blog? For your data binders, does each student have 2? 1 for math and 1 for ELA? I can’t wait to look through all your stuff this summer. Thank you for sharing. HI Rachel! Don’t stress! 3rd graders are just taller 1st graders with much more independence! 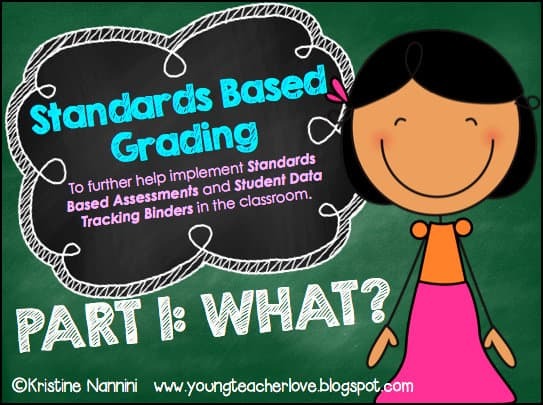 :) Read through my blog posts about my data binders and I bet you won’t even need to read Marzano’s book! They are super easy to implement and I promise you will love them! Check out my Free Frequently Asked Questions Pack too! This will help with implementation. Let me know if I can help you with anything else! Congrats on the move! Your materials are probably my favorite thing I have EVERY bought! I moved from 5th grade to 6th this past year, and am LOVING it, but missing using some of your materials. As I am reading through comments, I am sure hoping you might create more for 6th grade, and it looks like they are in the works??? My principal is willing to purchase whatever I want, for me AND for my teammate, because we have had so much success with your materials in our classroom! Thank you for your amazing products! Aw thank you so much Katie! 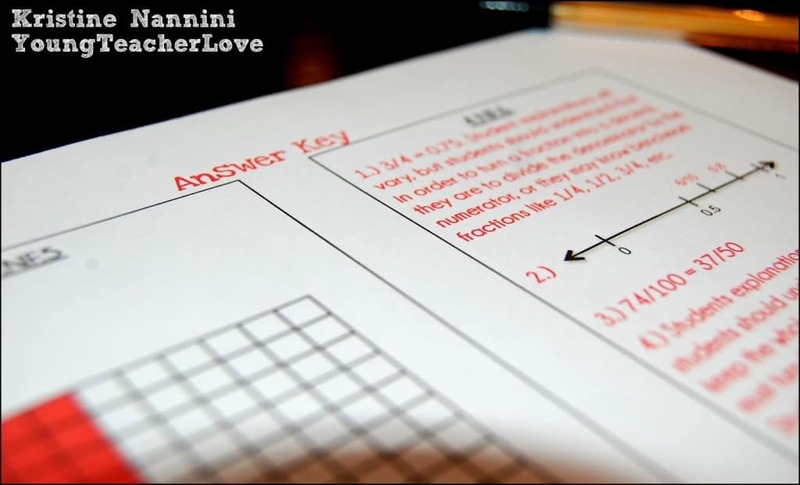 Will the 6th grade assessment pack be out this summer? I just bought your student data tracking binder pack and would love have all of your ELA and math resources for 6th. Any idea on if/when they might be ready? You are really amazing! Thank you!! :) Yes they will be out! I’m working on them now! Super excited to see the 6th grade assessments. I will definitely purchase them once they are up! Any ideas when that will be??? Because I am lazy and don’t want to search for it, do you use identical pre & post assessments? My goodness I wish you had one for 1st grade! :-( but I’ve saved your post to refer to as I plan to implement student data notebooks. I’m so excited to see your sixth grade assessments!! Any idea how soon I can purchase them? This is truly amazing. I am so thankful you are using the gifts God has blessed you with to help other teachers. LIKE ME! I will soon be purchasing your 2nd and 3rd Math SBAs. Thank you for using your gifts to benefit others. Additionaly, would you be adding 2nd and 3rd ELA SBAs? I can’t wait if you are going to! Thanks so much Hillary! 3rd grade ELA assessments are coming! I would love to see second grade ELA. We are block teaching and I have ELA and Social Studies. This would be awesome for my classes. I love the way you broke the standards apart. We, as a grade level, have been working on that. I really like how YOU broke them down. I noticed you do not have first grade. Do you have any “how to” directions? I’d like to do that for first grade. I see you have had a request for 7th grade as well. From what I have seen you are focused on elementary. Is there any hope for 7th grade (math)? If not, is there anyone you could recommend to check out? I have been looking around and have been unsuccessful for anyone my thing quite this comprehensive. Thanks everyone! At this time, I don’t have plans to make a 1st grade or 7th grade version. Sorry! I am having trouble finding 6th Grade Common Core ELA/Literacy Assessments and Teaching Notes *ALL STANDARDS. Can you point me to the link to purchase? I love the 5th grade set and am planning on purchasing it as well! Thank you so much! @Carla- At this time I don’t have a 6th grade ELA version. Sorry! Thank you for your kind comments! Your work is amazing! If you don’t plan on doing 8th grade, do you have something/somewhere you recommend? @Samantha- Thank you so much! At this time, I don’t have plans to create an 8th grade version. Sorry! Are you planning to create a 6th grade ELA student data binder? Amy- Yes! Make sure you follow my store on TpT to receive an email as soon as it is posted. Thanks! I hope you will work on 1st grade math and then ELA. I purchased your products for 3rd grade when I taught that grade and loved them. I would love to have them now that I am in 1st grade. 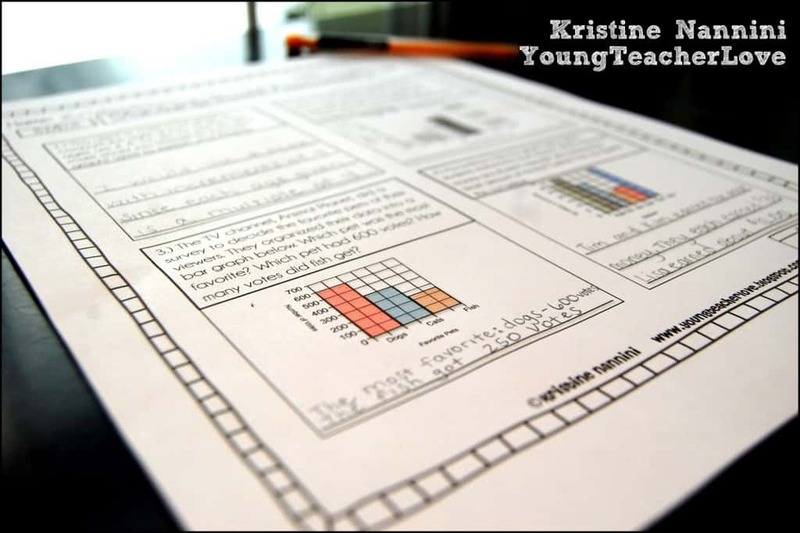 As a special educator, the way you create the assessments and organize the data collection makes everything I have to do when it comes to my students’ IEPs easy-from writing goals and objectives to progress reports on those goals and objectives. It easily allows for the kind of detail needed. Hi Kimberli- Thanks so much for your kind words! At this time, I haven’t decided if I will be creating any lower-elementary versions. Have a great day! Hi Shelby- Thanks for your comments. I appreciate your kind words! At this time, I don’t have plans to create a 7th grade version. However, make sure you follow my store to receive an email notification if I change my mind. Have a great day! I am interested in your fifth grade set, but have many questions about how to implement. Do you use this with a reading curriculum? I am required to use a specific curriculum, but am hoping that I can use both that and this product. How exactly do you teach this? Do you just use the teaching notes, or do you have additional things you have to come up with? I’m worried about how to best implement this without completely abandoning my required curriculum. Thanks! 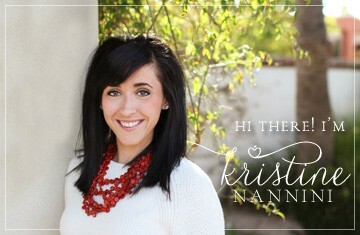 Hi Megan- Feel free to send me an email at nannini.kristine@yahoo.com so we can chat a bit more. Thanks so much! Any chance you would ever do 7th and/or 8th grade? These are amazing resources and as a data coach I would love to use these at the middle school level. Thanks! Hi Lauren- Thanks so much for your kind words! I just finished 6th grade ELA, and quite a few 7th grade teachers are purchasing it and loving it. Read through the feedback from some of those 7th grade teachers. I hope that helps! Have a great day! I loved your 4th grade materials, and just previewed your 6th. Your work is phenomenal! I just switch positions to 7th grade…will you ever venture to the 7th grade ELA world? Your resources are amazing!! I used them in my 3rd grade senior internship class. I just got hired as a Kindergarten teacher and was wondering if you would be working on creating a resource for those standards. I would love to use them in my room as a first year teacher. I believe it would help me tremendously!! Any feedback you can provide would be appreciated. Thanks so much for all you do for us!! Hi Christi- Thank you so much for your kind words! At this time, I don’t have plans to create any kindergarten resources. However, if you are interested in my Student Data Tracking Binders, these are all editable. So you could purchase any grade level and change the standards to match your grade level’s standards. I hope that helps! Congratulations on the new position! Love your work, still not considering doing a Kindergarten version? You could probably do it in your sleep (; Thanks for helping teachers have great resources to best serve our kiddos! Love from Costa Rica. Hi Lourdes- Thanks so much for your kind words! At this time, I don’t have plans to create a kindergarten version. Take care! Could you maybe create a template that works the same way for the TEKS in texas? Hello! Thanks so much for your question! Most of the TEKS standards are very similar to the CCSS. If you do a quick Google search comparing the two, you will see how similar the standards are. I hope that helps! Love this!! Is it possible to get 7th grade assessments!?!? Thank you, Wendy! At this time, I don’t plan on creating a 7th grade version.